The text that follows is a PREPRINT. Fearnside, P.M. 2004. Greenhouse gas emissions from hydroelectric dams: Controversies provide a springboard for rethinking a supposedly “clean” energy source, Climatic Change 66(1-2): 1-8. Nearly everyone has opened a bottle of Coca Cola and seen the many tiny bubbles that immediately emerge from the liquid. The gas (in this case carbon dioxide) is dissolved in the water that makes up most of the soft drink. The solubility of the gas is higher under pressure in the closed bottle than it is when the pressure is released by opening it – the result of the chemical principle known as Henry’s law, which holds that the solubility of a gas in a liquid is directly proportional of the partial pressure of the gas. Divers are familiar with the fact that a sudden lowering of pressure can cause gases to come out of solution, nitrogen bubbles in the blood (“the bends”) being a deadly risk of the rapid lowering of pressure that occurs if a diver rises to the surface too fast. In the case of water released from deep in the water column of a hydroelectric dam, the effect of pressure is compounded by the effect of temperature, as the warming of the water also reduces gas solubility (Le Chatalier’s principle). The effect of pressure release is both great and immediate, while reaching a new temperature equilibrium provides a short delay for the effect of Le Chatalier’s principle. The difference in pressure between a closed and an open bottle of Coca Cola is minor compared to the pressure at depth in a hydroelectric reservoir. Most of us have experienced the pressure on our eardrums when we dive two or three meters to the bottom of a swimming pool. The pressure at 34.6 m – the depth at the turbine intake at Brazil’s Tucuruí Dam – is very much more (about 3 atmospheres). 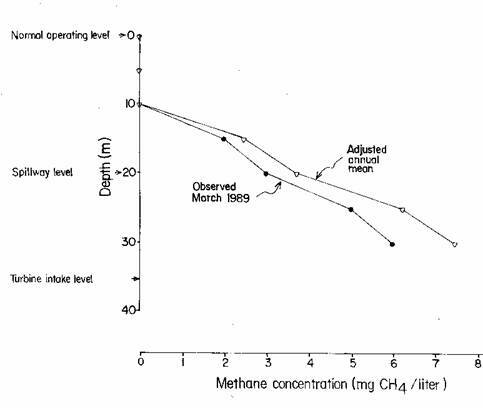 At about 10-m depth a thermocline impedes water mixing and diffusion of methane (CH4) to the surface. As one descends further in the water column, the concentration of CH4 increases (Fig. 1). The concentration in the Tucuruí reservoir measured at a depth of 30 m was 6 mg/liter of water in March 1989 (data of José G. Tundisi published by Rosa et al., 1997, p. 43); while the concentration at 34.6 m is estimated at 7.5 mg/liter after adjustment for the annual cycle (based on measurements from the Petit Saut dam in French Guyana: Galy-Lacaux et al., 1999) and the conservative assumption that the concentration does not continue to increase below 30 m depth in the water column. When the water emerges from the turbines the pressure instantly drops to a level of one atmosphere, and the great majority of the dissolved gas can be expected to be released immediately. For example, when water samples are brought to the surface from the bottom of a reservoir in a sampling flask the water foams like Coca Cola when the flask is opened. Gases released in this way include both CO2 and CH4, but, even though present in smaller quantities, it is the CH4 that makes the impact of hydroelectric dams a concern for global warming. Methane is also released from the water passing through the spillway, where gas release will be driven not only by the change in pressure and temperature but also by the sudden provision of a vast surface area when the water is pulverized into droplets. At Tucuruí’s spillways, water shoots out of a narrow horizontal slit at a depth 20 m below the surface. Water at this depth has a substantial load of methane (estimated at 3.1 mg/liter on average over the year in water released by the spillway: Fearnside, 2002a: 82). The ski-jump design of the spillway is intended to maximize oxygenization in the river below the dam, but the other side of this coin is the immediate release of methane contained in the water (Fig. 2). Because an average of 353.6 × 1012 liters of water pass through the Tucuruí Dam annually, either through the turbines or the spillways, the amount of CH4 exported through these structures is tremendous. At Tucuruí in 1991, considering the assumptions regarding percentages released of the CH4 from this water, total 0.7-1.2 × 106 Mg of CH4 gas, or 4.0-7.1 × 106 Mg of CO2 carbon equivalent if computed using the global warming potential of 21 adopted by the Kyoto Protocol (Fearnside, 2002a). The total emission, including surface emissions of methane and above-water biomass emissions of methane and carbon dioxide, is 7.0-10.1 × 106 Mg of CO2 carbon equivalent—an emission equivalent to the fossil-fuel carbon released by the city of São Paulo. One can calculate that the effects of pressure and temperature would release almost all of the methane contained in the water when it passes through either the turbines or the spillway. The partial pressure of methane in the atmosphere is very low (1.5 × 10-6). Given the Henry’s Law constant of CH4 of 67.4 kPa m3 mol-1 (Anonymous, 1999, p. 8-92), or 0.681 atm/(mol/liter), the equilibrium of CH4 at one atmosphere pressure and 25o C temperature is only 0.035 mg/liter. When water emerges from the turbines of Tucuruí with a methane concentration of 7.5 mg/liter, 99.5% of this is lost as the combined effect of lowering the pressure to one atmosphere and raising the temperature to the neighborhood of 25o C. The role of temperature in this can be visualized from the relationship of temperature to CH4 solubility (Geventman, 1999). For example an increase in temperature from 15o C to 25o C reduces the solubility of CH4 in water by 18.3%. Choosing the method to estimate methane release is critical to the conclusions reached: if the method chosen fails to detect a release, the appropriate conclusion may not be that there is no release, but rather that one has simply been looking in the wrong place. For example, Rosa et al. (2004) treat turbine and spillway emissions as negligible, based on measurements of surface fluxes made from several hundred meters to several tens of kilometers below the Petit Saut Dam (Galy-Lacaux et al., 1997). Unfortunately for the environment, the gas release from the water emerging from the turbines probably occurs within a few seconds – like the bubbles released by a bottle of Coca Cola. The fact that little or none is still being released as the water flows further down the river is irrelevant; in the case of the surface-flux measurements they cite from French Guiana, it is doubly unsurprising that little methane emission was found because the measurements were made below a 4-m high weir designed to aerate the water (Gosse, 1999). The amount of methane released at the turbines and spillway is best calculated by difference, based on the CH4 concentration in the water at the turbine depth behind the dam and in the water in the river below. Because the new equilibrium is reached very quickly when the water emerges from the turbines, there is no time for bacteria to work to reduce CH4 to CO2 before the gas is released to the atmosphere. Carbon dioxide emissions from reservoirs are quite different from methane emissions in terms of their net impact on global warming. Unlike methane, only a portion of the carbon dioxide emitted can be counted as a net impact because much of the CO2 gas flux observed is cancelled out by uptakes in the reservoir. Methane does not enter photosynthetic pathways, although it is eventually reduced to CO2 that can be removed by photosynthesis. For the approximately 10 years, on average, that each methane molecule remains in the atmosphere the global warming it causes must be considered a net impact of the dam. The natural methane emission from a stretch of undammed river is small compared to emission from a reservoir (dams are usually built at the locations of former rapids, rather than flat swampy areas where methane would be produced in natural wetlands). The reservoirs become virtual methane factories, with the rise and fall of the water level in the reservoir alternately flooding and submerging large areas of land around the shore; soft green vegetation quickly grows on the exposed mud, only to decompose under anaerobic conditions at the bottom of the reservoir when the water rises again. This converts atmospheric carbon dioxide into methane, with a much higher impact on global warming than the CO2 that was removed from the atmosphere when the plants grew (21 times more per ton of gas, or 7.6 times more per ton of carbon). CO2 that is released from the water surface in the reservoir, as well as CO2 released at the turbines or the spillway, cannot be considered a net emission. The carbon contained in this CO2 will have come from sources such as photosynthesis in the reservoir (phytoplankton, macrophytes), from organic material and eroded soil washed into the water from the land, and from dissolved organic carbon that enters the river from ground water-(for example from root exudates and litter decomposition). CO2 carbon derived from photosynthesis in the reservoir is merely recycled from the atmosphere, and would be cancelled out if measurements were available of fluxes into the water as well as out of it. The carbon from the land can be considered to be subject to aerobic decomposition and emission as CO2 in the reference case without a dam, and so cannot be considered a dam impact. Carbon in the reservoir that is not oxidized may be deposited in sinks such as the sediments at the bottom of the reservoir or downstream in the floodplain (várzea) or in the delta, or in ocean sediments, or it may remain as dissolved organic carbon (DOC) for a long period. Because what is deposited in the reservoir sediments would probably otherwise have been deposited in one of the other sinks, this carbon removal cannot be counted as a reservoir benefit. One source of carbon dioxide must be counted as a net impact of dam construction. This is the CO2 released by above-water decomposition of the portions of the flooded trees that are left projecting out of the water. The amount of carbon involved is substantial during the first decade after reservoir filling. Estimates of emissions from this source for the year 1990 (i.e., the baseline year for national greenhouse gas inventories under the climate convention) totaled 10 million tons of carbon for the existing dams in Brazilian Amazonia: 2.55 at Tucuruí, 6.43 at Balbina, 1.13 at Samuel and 0.01 at Curuá-Una (Fearnside, 1995, p. 16). Emissions from several sources are concentrated early in the life of a dam, giving the greenhouse impact of hydropower a time profile that is significantly different from the emissions that would be produced from generating the same amount of electricity from fossil fuels. Dam construction emissions, such as those from cement and steel, even occur several years before any power generation begins. CO2 from above-water decay of dead trees and CH4 from the soft parts (leaves) of the initial vegetation and from macrophyte decomposition are highest during the first years after filling a reservoir. Any weighting of the emissions impacts for time preference will strongly favor fossil fuel alternatives over hydroelectric generation (Fearnside, 1997, 2002b). Rosa et al. (2004) cast the debate on hydroelectric emissions as one of two sides: one composed of the hydroelectric lobby that claims dams emit no greenhouse gases, and the other composed of those who are implied to be subject to “the lures of the thermo-power and nuclear-power lobbies.” I would suggest that those who have pointed out that hydroelectric dams have substantial emissions are not the pawns of either lobby. “We [the MCT climate sector] talked with Prof. Pinguelli [Rosa] and I asked the help of ELETROBRÁS [on the subject of greenhouse gas emissions from dams]; actually, it was ELETROBRÁS that coordinated this work [i.e., the work reported in Rosa et al., 2004] exactly because of this, because this subject was becoming political. It has a very great impact at the World level; we are going to suffer pressure from the developed countries because of this subject. And, this subject was little known. It is mistreated. It is mistreated and continues to be mistreated by Philip Fearnside himself, and we have to be very careful. The debate that is taking place now in the press shows this clearly; that is to say, you can take any one-sided statement to show that Brazil is not clean, that Brazil is very remiss, that Brazil, implicitly, will have to take on a commitment [to reduce emissions] in the future. This is a great political debate and we are preparing ourselves for it.” (Brazil, MCT, 2002). Needless to say, the idea that research in this area must be carefully “coordinated” in order to assure that only politically palatable conclusions are reached is not the only viewpoint. As unpopular as it may be, I defend the position that all sources and sinks must be quantified and taken into account in policy making, in this case including both the methane emitted from the turbines and spillways and the carbon dioxide from above-water decay of standing trees in Amazonian reservoirs. In 1990 at Tucuruí, for example, these sources (not counted in the study coordinated by ELETROBRÁS) made up at least 93% of the total emission (Fearnside, 2002a). ELETROBRÁS, the government agency for planning and promoting energy development throughout Brazil, has massive plans for hydroelectric dam construction in Amazonia. The only time the full extent of these plans has been revealed to the public was in the 2010 Plan, which leaked to the public and was subsequently released officially in December 1987. All of the 79 dams listed for Amazonia, independent of the expected date of construction, total 10 million hectares of water area (Brazil, ELETROBRÁS, 1987, p. 150). This is an area approximately the size of the US state of Kentucky, and represents 2% of Brazil’s 9-state Legal Amazon region, or 3% of the portion of the region with tropical forest. In the wake of criticism of this plan, and especially after a 1989 confrontation with indigenous peoples over plans for six dams in the Xingu River basin (the first of which, now called Belo Monte, is currently the top priority of ELETROBRÁS for construction), the agency has since only revealed plans for successive short lists of dams slated for construction over time horizons of up to 10 years, rather than discuss the overall plan. The time scale for construction of specific dams has stretched repeatedly as a result of the financial limitations of the country’s economy and government budget, but the overall goal remains unchanged. These dams imply a multitude of social and environmental impacts, of which impact on greenhouse-gas emissions is one (Fearnside, 1999, 2001). Controversies provide a springboard for rethinking the impacts of hydroelectric dams, both in terms of the amounts of gases emitted and the theoretical structure most appropriate for comparing their impacts: the choices of what emissions to count or not count, and the decisions made, by default or by design, on how emissions are treated when they occur at different times and are of gases with different lifetimes. This springboard allows a rethinking of the role of hydroelectric dams in climatic change and the proper counting of the environmental costs of dams. This accounting of environmental costs is needed as an input to assessing the appropriate role of building new dams as a part of development in Amazonia and throughout the World. I thank the National Council for Scientific and Technological Development (CNPq)(Proc. 470765/01-1) for financial support and Bruce Forsberg for comments. Brazil, ELETROBRÁS: 1987, Plano 2010: Relatório Geral. Plano Nacional de Energia Elétrica 1987/2010 (Dezembro de 1987, Centrais Elétricas do Brasil (ELETROBRÁS), Brasília, DF, Brazil. 269 pp. Brazil, MCT: 2002, ‘Degravação do workshop: Utilização de Sistemas Automáticos de Monitoramento e Medição de Emissões de Gases de Efeito Estufa da Qualidade da Água em Reservatórios de Hidrelétricas’, Centro de Gestão de Estudos Estratégicos do MCT, Brasília – DF, 06 de fevereiro de 2002. Ministério da Ciência e Tecnologia (MCT), Brasília, DF, Brazil. http://www.mct.gov.br/clima/brasil/doc/workad.doc. Fearnside, P. M.: 1995, ‘Hydroelectric dams in the Brazilian Amazon as sources of 'greenhouse' gases’, Environ. Conserv. 22, 7-19. Fearnside, P. M., 1997: ‘Greenhouse-gas emissions from Amazonian hydroelectric reservoirs: The example of Brazil's Tucuruí Dam as compared to fossil fuel alternatives’, Environ. Conserv. 24, 64-75. 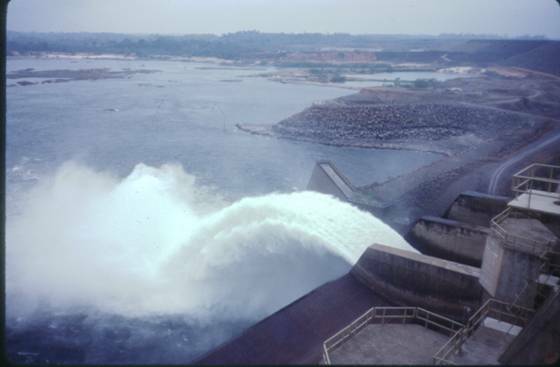 Fearnside, P. M., 1999, ‘Social Impacts of Brazil's Tucuruí Dam’, Environ. Manage. 24, 485-495. Fearnside, P.M.: 2001, ‘Environmental impacts of Brazil's Tucuruí Dam: Unlearned lessons for hydroelectric development in Amazonia’, Environ. Manage. 27, 377-396. Fearnside, P. M.: 2002a, ‘Greenhouse gas emissions from a hydroelectric reservoir (Brazil’s Tucuruí Dam) and the energy policy implications’, Water, Air and Soil Pollution 133, 69-96. Fearnside, P. M.: 2002b, ‘Time preference in global warming calculations: A proposal for a unified index’, Ecological Econ. 41, 21-31. Galy-Lacaux, C., Delmas, R., Jambert, C., Dumestre, J.-F., Labroue, L., Richard, S., and Gosse, P.: 1997, ‘Gaseous emissions and oxygen consumption in hydroelectric dams: A case study in French Guyana’, Global Biogeochem. Cycles 11, 471-483. Galy-Lacaux, C., Delmas, R., Kouadio, J., Richard, S., and Gosse, P.: 1999, ‘Long-term greenhouse gas emissions from hydroelectric reservoirs in tropical forest regions’, Global Biogeochem. Cycles 13, 503-517. Geventman, L. H.: 1999, ‘Solubility of selected gases in water’, in Lide, D. R. (ed. ), CRC Handbook of Chemistry and Physics, 1999-2000 80th edition, CRC Press, Boca Raton, Florida, pp. 8-86 – 8-90. Gosse, P.: 1999, ‘A system for reoxygenating the water at Petit-Saut’, http://www.edf.fr/der/html/der/environnement/ptiso.en.htm. Anonymous: 1999, ‘Aqueous solubility and Henry’s Law constants of organic compounds’, in Lide, D. R. (ed. ), CRC Handbook of Chemistry and Physics, 1999-2000 80th edition, CRC Press, Boca Raton, Florida, pp. 8-91 – 8-102. Rosa, L. P., dos Santos, M. A., Tundisi, J. G., and Sikar, B. M.: 1997, ‘Measurements of greenhouse gas emissions in Samuel, Tucuruí and Balbina Dams’, in Rosa, L. P., and dos Santos, M. A. (eds. ), Hydropower Plants and Greenhouse Gas Emissions, Coordenação dos Programas de Pós-Graduação em Engenharia (COPPE), Universidade Federal do Rio de Janeiro (UFRJ), Rio de Janeiro, Brazil, pp. 41-55. Rosa, L. P., dos Santos, M. A., Matvienko, B., dos Santos, E. O., and Sikar, E.: 2004, ‘Greenhouse gases emissions by hydroelectric reservoirs in tropical regions’, Clim. Change (this issue). Figure 1. Methane profile at Tucuruí in March 1989 and as adjusted for an annual cycle (Fearnside, 2002a). Figure 2. Spillway at Tucuruí. The ski-jump design oxygenates the water, but at the same time releases methane immediately. The spillway draws water from a depth of 20 m, where methane concentration is high (Fearnside, 2001).